the possessions that are terrorizing their city. Director Scott Derrickson (Sinister, The Possession of Emily Rose) brings us Deliver Us From Evil, a crude-but-biblically titled horror that feels more like an apologetic video for a fundamentalist Catholic evangelistic effort aimed at lapsed, on-the-fence Catholics in New York as opposed to moviegoers at large. 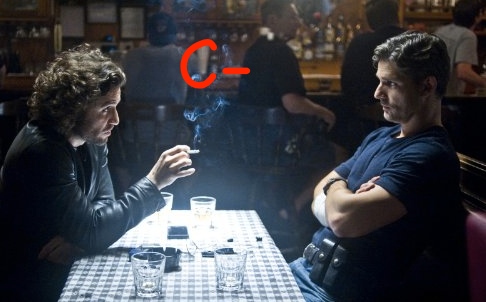 And while Eric Bana (Hulk, Vantage Point) and Édgar Ramírez (The Bourne Ultimatum) work great together, the writing behind who they are and what they are doing is left hanging in a wishy-washy, unoriginal patchwork of a film that is neither interesting, nor scary. Ralph's beautiful wife (Olivia Munn) is neglected, as is his daughter (Lulu Wilson). The situation at home is only one more reason why theses events, and the events of the film as a whole, are not hard to see coming. Beyond the tendency to be effectively creepy through distant facial expressions and stare-downs, the only real scare that is memorable is seen in the trailer, as a stuffed animal falls off of a shelf and rolls forward to face Ralph's little girl. Only standard-fare horror entertainment (flash-in/flash-out images of tormented souls and super-strong possession victims, grayed corpses, etc.) follows this. Joel McHale, as Ralph's partner, did nothing for the story. The inclusion of only a few small surprises or emotional moments throughout just make us want more (but then never deliver on them). The possession angle is pretty well safely called a dead-end genre at this point. Everything that can be done has been done. If this doesn't prove it, I don't know what does!